Girls who are told by a parent, sibling, friend, classmate or teacher that they are too fat at age 10 are more likely to be obese at age 19, a new study by UCLA psychologists shows. Overall, the girls labeled fat were 1.66 times more likely than the other girls to be obese at 19, the researchers found. They also found that as the number of people who told a girl she was fat increased, so did the likelihood that she would be obese nine years later. The findings appear in the June 2014 print issue of the journal JAMA Pediatrics and are published online April 28. "Simply being labeled as too fat has a measurable effect almost a decade later. We nearly fell off our chairs when we discovered this," said A. Janet Tomiyama, an assistant professor of psychology in the UCLA College of Letters and Science and the study's senior author. "Even after we statistically removed the effects of their actual weight, their income, their race and when they reached puberty, the effect remained. "That means it's not just that heavier girls are called too fat and are still heavy years later; being labeled as too fat is creating an additional likelihood of being obese." "Being labeled as too fat may lead people to worry about personally experiencing the stigma and discrimination faced by overweight individuals, and recent research suggests that experiencing or anticipating weight stigma increases stress and can lead to overeating," he said. 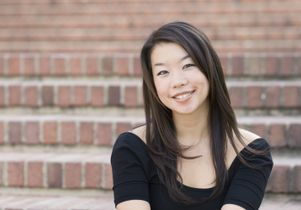 In a separate study published last December, Tomiyama, former UCLA psychology faculty member Traci Mann (now at the University of Minnesota–Minneapolis) and UCLA graduate student Britt Ahlstrom analyzed 21 long-term studies on weight loss and health and found no clear relationship between weight loss and health improvements related to hypertension, diabetes, cholesterol and blood glucose. "We found no connection whatsoever between the amount of weight loss — whether small or large — and any of these health outcomes," said Tomiyama of the study, which appeared in the health section of the journal, Social and Personality Psychology Compass. "Everyone assumes that the more weight you lose, the healthier you are, but the lowest rates of mortality are actually in people who are overweight," she said. "At a body mass index of 30, which is labeled obese, there is no increased risk of mortality. This has now been shown over and over again. The highest rate of mortality is in the underweight people." The research findings also confirmed the results of a 2007 study in which Tomiyama, Mann and colleagues analyzed 31 long-term studies and found that people can initially lose 5 to 10 percent of their weight on any number of diets, but the majority regain all the weight, plus more. Only a small minority, they discovered, sustain their weight loss. "If dieting worked, it wouldn’t be a $60 billion dollar industry," said Tomiyama, who noted that trying to be thin is similar to trying to be taller. Research has shown that twins separated at birth have very similar weights, regardless of the environment in which they grow up, Tomiyama noted. She recommends focusing on eating healthier and fitness rather than obsessing about weight and strongly opposes stigmatizing people who are overweight. "When people feel bad, they tend to eat more, not decide to diet or take a jog," she said. "Making people feel bad about their weight could increase their levels of the hormone cortisol, which generally leads to weight gain." Tomiyama, who directs UCLA’s Dieting, Stress and Health (DiSH) laboratory, is conducting follow-up studies with the women in Northern California who participated in the study published in JAMA Pediatrics; these women are now in their 30s and many of them have children. They came from a range of economic backgrounds. She also is currently studying research subjects who have been stigmatized for being overweight and measuring their cortisol levels.